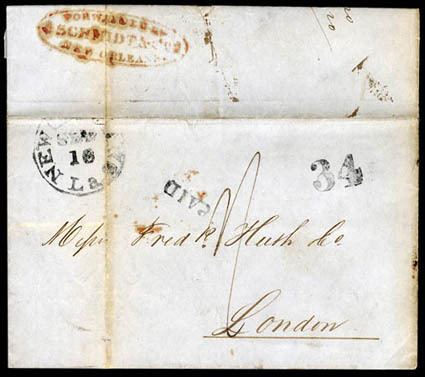 (Retaliatory Rates) 1848 (Aug. 26) Vera Cruz, Mexico to London, England via New Orleans, datelined folded letter with red "Forwarded by Schmidt & Co., New Orleans" forwarders oval on flap, entered mails with black "New Orleans, La. Sep. 16" cds and matching "Paid" and "34" rating handstamps, carried by Cunard Line Europa from New York Sep. 27th to Liverpool arriving Oct. 9th, red London (10.10) arrival backstamp and manuscript "1/-" shilling due rating; minor fold wear and toning, F.-V.F., An uncommon example of New Orleans "34" retaliatory rating handstamp. 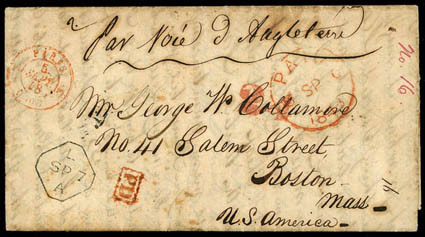 (Retaliatory Rates) 1848 (Sep. 5) Paris, France to Boston, Mass., folded letter with red Paris cds and manuscript "15" décimes prepaid rating on reverse, carried by Cunard Line Acadia from Liverpool Sep. 9th to Boston arriving Sep. 24th, London "Paid 6 SP" and Liverpool (9.7) transits, red "24" retaliatory due rating for 24¢ packet fee; light toning, ex-Winter. Letter carried on 12th of 25 Cunard voyages westbound to Boston under the retaliatory order. 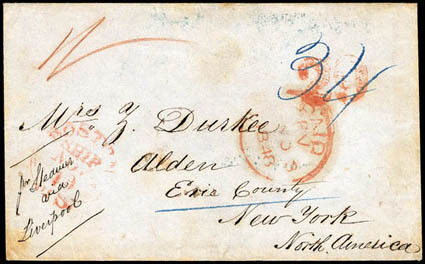 (Retaliatory Rates) 1848 (Nov. 3) London, England to Alden, N.Y., cover with blue "Boswell Rd" station backstamp with red crayon "1/-" shilling prepaid packet rating, red London Paid (11.3) cds, carried by Cunard Line Acadia from Liverpool Nov. 4th to Boston arriving Nov. 19th, red "Boston Ms. 'Ship' Nov 19" cds and matching "29" cent retaliatory due rating handstamp updated with blue ms. "34" for 10¢ inland postage over 300 miles plus 24¢ packet fee, Very Fine and scarce retaliatory rerating. (Retaliatory Rates) 1848 (Nov. 17) New Orleans, La. to London, England, folded letter with black "New Orleans La. Nov 18" cds and matching "Paid" and "34" rate handstamps for prepaid single rate of 10¢ postage plus 24¢ packet fee, carried by Cunard Line Acadia from Boston Nov. 29th to Liverpool arriving Dec. 12th, London (12.13) backstamp arrival and manuscript "1" shilling retaliatory due packet rating; two file folds, F.-V.F., ex-Winter. Letter carried on the 22nd of 26 Cunard mail east bound voyages to England under the retaliatory order. This was the final mail voyage of the "Acadia" for Cunard. (Retaliatory Rates) 1848 (Nov. 22) London, England to New York, N.Y., folded letter with red "Piccadilly C.O" straightline and red London (11.22) cds with manuscript "1/-" shilling prepaid rating, Liverpool (11.23) transit, carried by Cunard Line Canada from Liverpool Nov. 25th to New York arriving Dec. 14th, New York red "24" cent rating handstamp, Very Fine, A scarce example of the New York small "24" retaliatory rating handstamp. .
1849 (Apr. 11) Warren, Pa. to Zierolshofen, Baden, folded letter with blurry "Warren, Pa. Apr 11" origin cds and matching "Paid" handstamp with manuscript "10" rating, red "New-York Apr 15" exchange backstamp with black "24" debit handstamp to Bremen, carried by Ocean Line Hermann from New York Apr. 2nd to Bremerhaven arriving May 7th, Very Fine, ex-Winter. ONE OF ONLY FIVE RECORDED EXAMPLES OF THE HANNOVER "9 AMERICA / ÜBER BREMEN" HANDSTAMP IN BLACK INK. The Hannover post in Bremen debited Hannover 9 gutegroschen, a restatement of the 24¢ U.S. debit. The "9 America / über Bremen" handstamp was introduced in May 1849 and is known in black ink on this one voyage only. Hannover marked 10 1/3 ggr. debit to Thurn & Taxis Post, later marked as 45 kr. Thurn & Taxis Post added 6 kr. transit fee to Baden, where 8 kr. Baden internal fee also was added for total postage due of 59 kr. 1851 (Mar. 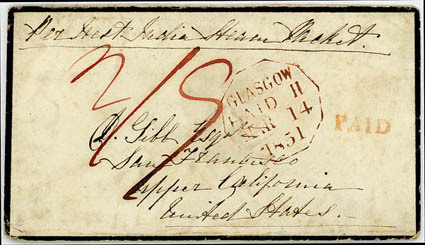 14) Glasgow, Scotland to San Francisco, Cal., mourning cover with red "Glasgow Paid Mar 14 1851" datestamp and red manuscript "2/9" prepaid packet rating for West Indies rate to Cal., endorsed "Per West India Steam Packet", London (3.17) and Liverpool (3.17) backstamps, carried by RMSP Severn from Southampton Mar. 17th to Chagres arriving Apr. 15th, San Francisco red "Paid" handstamp, F.-V.F., ex-Winter. ONE OF FIVE RECORDED COVERS BY THE WEST INDIES ROUTE WITH THIS RATE. Commencing October 1850, letters to California could be sent fully paid to destination in the British mails via Chagres and Panama. The rate for a ½ oz. 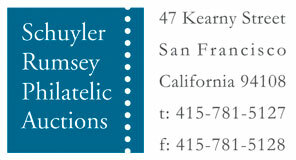 letter was 2s9d (66¢), a very high rate. 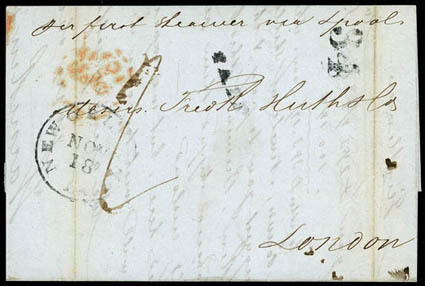 Since the rate was reduced in July 1851, eight months later, very few letters were actually sent at this rate. This letter was carried from Panama to San Francisco by Pacific Mail Steamship Co. steamer Tennessee. 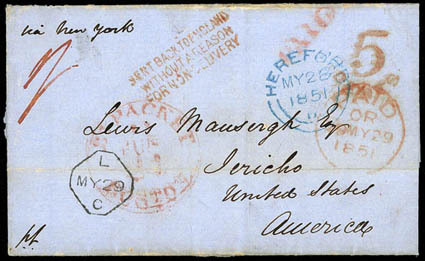 Letter in closed mail bag from London to San Francisco, where red PAID struck. 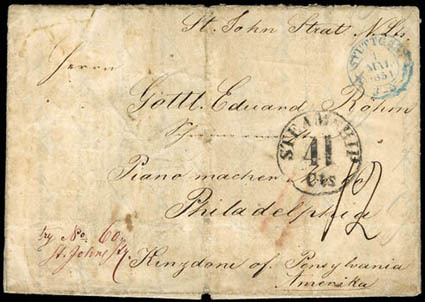 1851 (May 1) Stuttgart, Wurttemberg to Philadelphia Pa., cover with blue "Stuttgart, 1 Mai 1851" cds and sent unpaid, St.P.A. Bremen (5.6) backstamp, red crayon "11" and manuscript "12" ratings, carried by Ocean Line Washington from Bremerhaven May 16th to New York arriving June 2nd, New York "Steamship 41 Cts" circular handstamp; aging and wear, Fine, ex-Schuh, Hahn. ONE OF ONLY TWO RECORDED EXAMPLES OF THIS "STEAMSHIP 41 CTS" 28MM CIRCULAR MARKING. 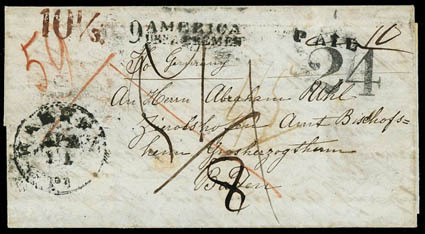 Postage due included 24¢ U.S. sea postage, 5¢ U.S. inland postage and 12¢ German transit postage from Prussia to Bremen. This handmade envelope shows no year date, but 1851 has been determined to be the most probable year based on steamship sailing data and similar STEAMSHIP markings used at New York. Note the "1" is inverted, indicating the numeral slugs were interchangeable. The cover here was carried on the same sailing as the other recorded ex-Winter cover (Sale 50 lot 319). 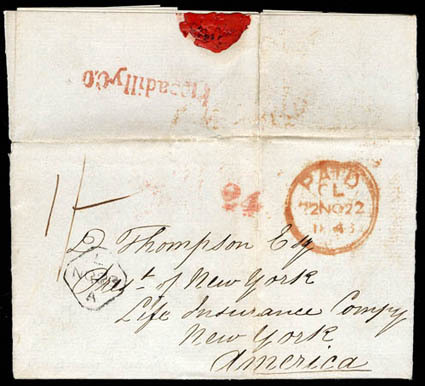 1851 (May 27) Hereford, England to Jericho, United States, blue datelined folded letter with blue Hereford (5.28) origin cds, red London Paid (5.29) transit cds, red manuscript "1/-" rating, Liverpool (5.29) transit and red "5/Cents" credit handstamp to U.S., carried by Cunard Line America from Liverpool May 31st to Boston arriving Jun. 11th, red "Br. Packet, Boston, Jun 11" exchange cds and "Paid" handstamp, no state was specified in the address so the letter was returned to London where it received the red "Sent Back To England, Without a Reason, For Non-Delivery" three-line handstamp; light edge toning, Very Fine. A SCARCE USE WITH A CLEAR STRIKE OF THE LONDON "SENT BACK TO ENGLAND" MARKING. This letter was probably returned to England because there were seven "Jericho" towns in the United States at this time and the state was not indicated in the address. 1852-1860, U.S. to Spain Transatlantic Mail, group of 6 covers including 1852 (Mar. 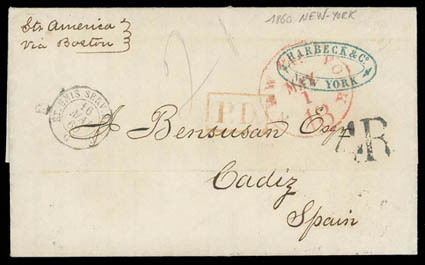 9) via London to Cadiz with various markings including Boston "5" debit rating and red "18R" final due rating; 1860 with red "New York 'Paid 18' May 1" exchange cds and "4R" handstamp, and 1859 New York with blue "Franco" paid handstamp, etc., F.-V.F.